Everyone ‘nose’ that laughing is good for you and Year 2 had a fit of the giggles when laughter yoga came to Rose Court! 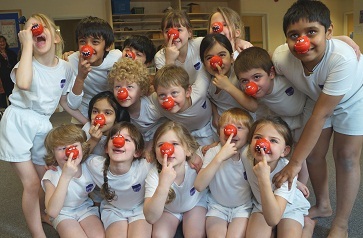 The fun session was provided by the Comic Relief team as a thank you to The Grammar School at Leeds (GSAL), which was one of Red Nose Day’s top 100 fundraising schools in 2011, contributing nearly £3,000 to the cause. Rose Court alone has raised £3,197 for Comic Relief since 1993, £534 of that in 2011. Leading the session were Gill and Geoff Lowe of Laughter Health in Grassington. Explaining that laughter yoga “is not yoga as you know it” Gill and Geoff had the children, aged six and seven, in stitches as they got their laughter muscles going with exercises, games and songs.